Way back in the early days people living in south Georgia had no markets near and so the people would gather their little plunder together, go in carts to Centerville on the St. Maria river, in Camden county, Ga. Early settlers of Ray City, Berrien County and the surrounding area traveled about 95 miles to trade at Centerville, also known as Center Village or Centreville, in present day Charlton County, GA.
1864 map detail showing locations of General Levi J. Knight’s residence (Ray City), Nashville, Troupville and Center Village (Centerville), with route from Berrien County to Centerville highlighted. 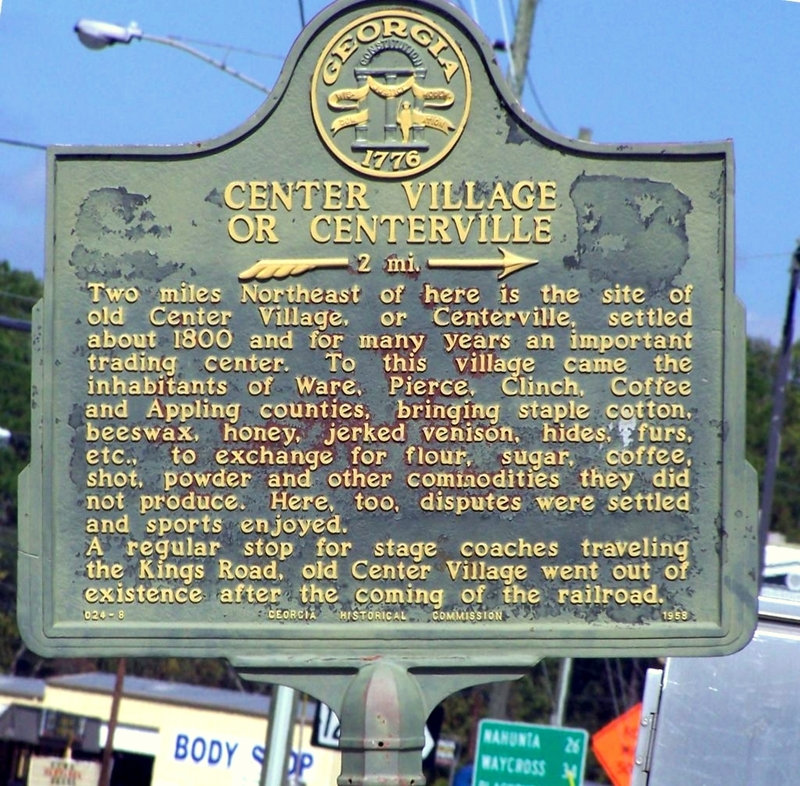 Centerville truly was at the center of an important crossroads of commerce for Wiregrass Georgia. Located on the St. Mary’s River about two miles east of Folkston, GA, Centerville was situated with convenient river access to the harbor at St. Mary’s and the Atlantic trade, the Kings Road, and also the Alachua Trail, an ancient and important commerce route from the Altamaha River, in Georgia, down into East Florida. Center Village, a town downriver from Trader’s Hill and established in 1800, was a border town devoted to defense and trade. Camp Pinckney housed border soldiers, and a ferry provided service across the St. Marys between Georgia and Florida and merchants. Tradesmen and other Crackers bartered, bought, and sold their wares on the town streets, settled disputes in public “fist and skull” fights, and wagered on horse racing. Waresboro, a hub for passenger, mail, and freight service on the Okefenokee’s north side, was established in 1824. It was fairly isolated initially, depending on mail service from the distribution station at Camp Pinckney, but gained population and prominence as Ware County’s seat during the antebellum period. All four of these towns faded away as the larger cities of Folkston (Charlton County) and Waycross (Ware County) became rail-road junctions in the postbellum era. But in the years before 1860, they were thriving trading centers and sites of sociability for the area’s white residents. Two miles Northeast of here is the site of old Center Village, or Centerville, settled about 1800 and for many years an important trading center. To this village came the inhabitants of Ware, Pierce, Clinch, Coffee and Appling Counties, bring staple cotton, beeswax, honey, jerked venison, hides, furs, etc., to exchange for flour, sugar, coffee, shot, powder and other commodities they did not produce. Here, too, disputes were settled and sports enjoyed. A regular stop for stage coaches traveling the King`s Road, old Center Village went out of existence after the coming of the railroad. A 1976 article, CENTER VILLAGE, GHOST OF THE PAST, by Carolyn DeLoach, Charlton County Herald, provides further reading. In 1836, a band of Indians raided the homestead of William Parker, pioneer settler of Berrien County. Since the spring of that year, pioneers all across Wiregrass Georgia had been facing increasing hostilities from the Native Americans who were being forced out of their ancestral lands. A previous post recounted a story by Martha Guthrie, and the role of her family in the last Indian encounters in Berrien County (see Martha Guthrie: Babe of the Indian Wars). Her parents, Dred Newbern and Bettsy Sirmons, were the nearest neighbors of William Parker. The Newbern’s homestead was located on the east bank of Five Mile Creek, perhaps about eight miles northeast of Ray City. This was probably somewhere in the present day vicinity of the Highway 168 bridge over Five Mile Creek. The Parker place was located a few miles further to the east, at the Alapaha River. About the year 1836 William Parker, (Short-Arm Bill) as he was called, and the father of C.G.W. Parker, and later a well-known doctor, was living in Berrien county on the old Patterson place. One winter day when Mr. Parker was away from home, several Indians appeared at the foot of the hill, at a spring, where the family got water. It is said that the Indians began to beat on logs, thereby attracting the attention of the people. It appears that the Indians meant to rob and not to murder, but as there were no men at home the women ran through the field , a back way, a distance of five miles to the home of Dread Newborn. The Indians robbed the house, broke open a trunk and got $300 in cash, cut the feather beds open, emptied the feathers out and took the ticks with them. A company of men soon collected together, under the command of George Peterson, Dread Newborn, William Parker, and others. The Indians were overtaken at the Allapaha river and three were killed, others made their escape but were overtaken at the St. Illa river, at what is now known as Indian Lake, about two miles northeast of the town of Axson, Ga. They were all shot and killed, except one squaw; it was reported that she was captured and shot. Dread Newborn, the son of Dread Newborn, who followed the Indians, informs me that the Indian woman was kept in prison for a while and then by direction of the government was returned to her own people. About this time a whole family by the name of Wilds was killed by the Indians, near Waresboro, Ga. One little boy, Reuben Wilds, made his escape. Of course there are a great many Indian stories, but the narratives I have given you are facts testified to by living witnesses and most worthy tradition, for the first time they are put into history of the Wiregrass country. 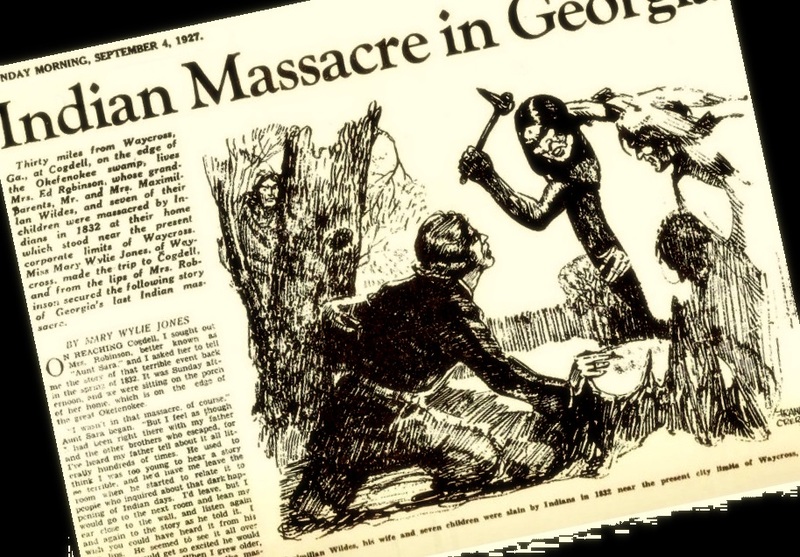 1927 Atlanta Journal account of the massacre of the Wildes family, July 22, 1838. The tommy hawk buried shall rest in the ground.